New Yorkers took part in air raid drills like the rest of the country and sought ways to protect themselves from attack. Beginning in 1954, the entire nation took part in an annual defense drill called “Operation Alert.” For the first exercise, on June 14, 1954, the FCDA pretended that nuclear bombs had hit about 100 American cities, including three attacks on New York: E. 57th St. and 1st Ave. in Manhattan, E. 157th St. and St. Ann’s Ave. in the Bronx, and Jay St. and Schermerhorn St. in Brooklyn. During the drill, everyone was supposed to get off the street and find shelter while government officials and volunteers practiced what their duties would be in an actual attack scenario. (Oakes, 1994, pp. 84-85; New York Times, 1954). 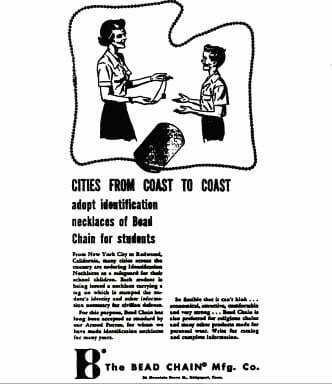 In 1956, the FCDA took charge of the way “Operation Alert” was presented in the media by producing its own short film. The film showed a strangely calm and efficient evacuation of New York, which had just been hit by five hydrogen bombs. For once, there is no traffic jam at the Lincoln Tunnel. (Oakes, 1994, pp. 96-97). The video below shows newsreel footage of the 1954 civil defense drill. Many New Yorkers who were children during the 1950s will tell you that they had to take cover under their desks during air raid drills. Civil defense drills in New York City schools started in Fall 1950 and students were required to wear identification tags. (Winkler, 1993, pp. 114-115). New Yorkers felt particularly vulnerable to attack in their major coastal location and many schemes to protect the city were put forward. Mayor Impellitteri and Harry Prince, President of the New York chapter of the American Institute of Architects both had plans for the city. The mayor wanted to use federal funds to improve the subway while at the same time turning it into a public shelter. Prince argued that the government should provide money to clear “slums” and replace them with fireproof public housing. (McEnaney, 2000, p. 44). One bizarre suggestion came from a New York engineer who proposed giant elevators to lower the city’s skyscrapers into the ground. (Boyer, 1994, p. 319). Many New Yorkers also objected to civil defense drills, calling attention to the futility of taking shelter. If there were a direct nuclear attack on New York City, going indoors would not be enough to save you. As a result, they organized protests of civil defense drills. 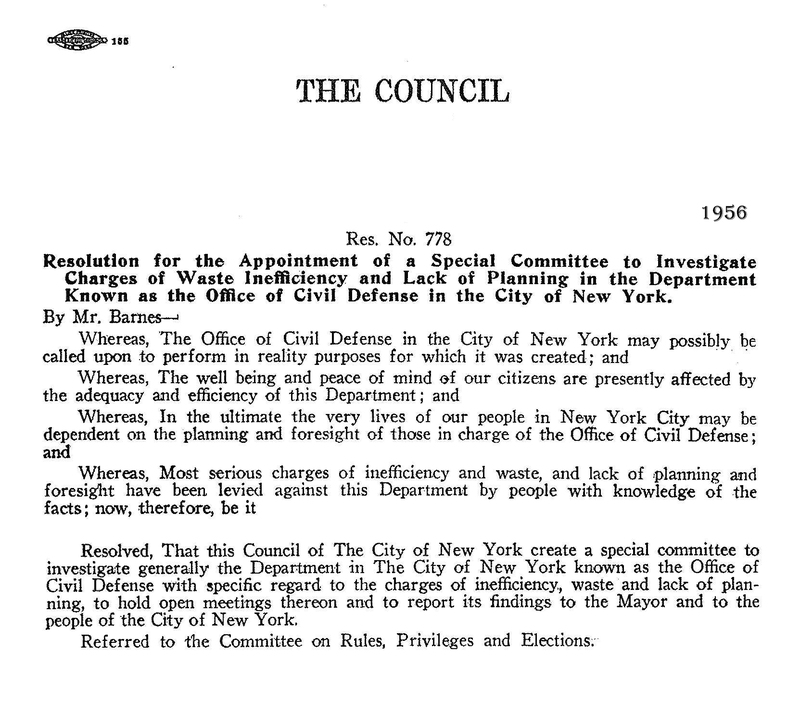 In 1956, New York’s City Council passed its first resolution on nuclear issues, calling for an investigation of allegations of inefficiency and poor planing in civil defense measures.